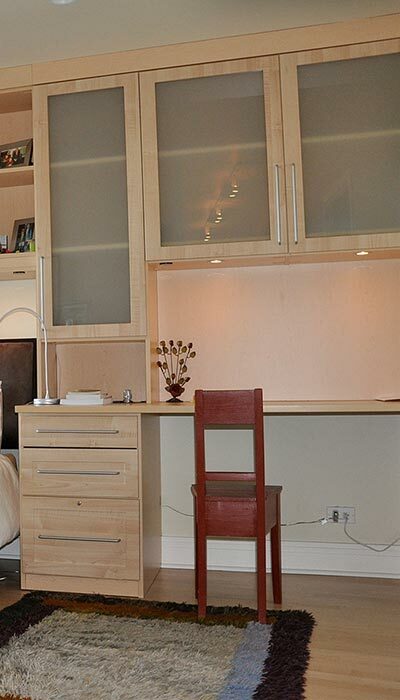 Notice how the Closet Works hutch unit was used as a bedside table in this application, bringing the available storage all the way up the wall without making the room seem cluttered — also eliminating the need to purchase additional pieces of furniture. This custom wall unit surrounds a queen size bed, integrating shelving, cabinets with frosted glass panel doors, integrated bedside tables and a desk/dressing table. The contemporary style and light wood tone finish give a crisp, clean, modern look. Although the simple lines offer a somewhat minimalistic aesthetic, there is plenty of storage in the shelving and cabinets that extend the entire length of the wall. The design is kept clean and simple by integrating the bedside tables and desk into the wall unit rather than purchasing separate pieces of furniture increases the functionality of the room — allowing more activities and more furniture to occur in less visual space.